There are some reports which indicate that several triazole derivatives have inotropic activity; however, the cellular site and mechanism of action at cardiovascular level is very confusing. In order, to have a clear understanding of these phenomena, a triazole derivative was synthesized to evaluate its biological activity on left ventricular pressure and characterize the molecular mechanism. The Langendorff technique was used to measure changes on perfusion pressure and coronary resistance in an isolated rat heart model in absence or presence of the triazole derivative. Additionally, the molecular mechanism involved in the inotropic activity induced by the triazole derivative was evaluated by measuring left ventricular pressure in absence or presence of the following compounds; prazosin, metoprolol, nifedipine, indomethacin and the compound BM-531. The results showed that the triazole derivative significantly increased the perfusion pressure and coronary resistance in comparison with the control conditions. Other data indicate that the triazole derivative increase left ventricular pressure in a dose-dependent manner (0.001 to 100 nM); nevertheless, this phenomenon was significantly inhibited only by indomethacin and BM-531 at a dose of 1 nM. Therefore, experimental results suggest that positive inotropic activity induced by the triazole derivative is via activation of TXA2. This phenomenon is particularly interesting because the inotropic activity induced by the triazole derivative involves a molecular mechanism different in comparison with other positive inotropic drugs. Several drugs have been developed to treatment of congestive heart failure (CHF); for example, the synthesis of strophanthidin which increases the force of contraction by changes in the calcium levels . In another study  showed the synthesis of F90927, which exerts a positive inotropic activity in cardiac muscle via activation of the L-type Ca2+ channel. In addition, a series of triazole derivatives [3,4] with positive inotropic activity have prepared, such as 1-(benzylamino)-3-(4,5-di-hydro[1,2,4] trizaolo[4,3-a]quinolin-7-yloxy)propan-2-ol and (1-substituted- N-(4,5-dihydro-1-methyl-[1,2,4]triazolo[4,3-a] qui nolin-7-yl)piperidine-4-carboxamides). Other studies show that the compounds N-(4,5-dihydro-[1,2,4] triazolo[ 4,3-a]quinolin-7-yl)-2-(piperazin-1-yl)acetamide derivatives exert positive inotropic activity in an in vitro model . In addition, other triazole derivatives (2-(4-(4- substituted benzyloxy)-3-methoxybenzyl)-1,4-diazepan 1-yl)-N-(4,5-dihydro-1-methyl[1,2,4]triazolo[4,3-a] quinolin- 7-yl)acetamides) were synthesized and their positive inotropic activity was evaluated by measuring left atrium stroke volume on isolated rabbit-heart preparations . One study nevertheless, showed that the triazole derivative (1,2,4-Triazolo[l,5-a]pyrimidines) exerted negative inotropic activity in the isolated guinea pig heart model . All these experimental data indicate that several triazole derivatives induce inotropic effects on the cardiovascular system; nevertheless, the cellular site and molecular mechanism involved in its inotropic activity are not very clear. This phenomenon may be due to either a difference in the chemical structure of the triazole derivatives or to the different pharmacological approaches used. Therefore, more pharmacological data are required to characterize the activity induced by the triazole derivatives at the cardiovascular level. To provide this information, the present study was designed to investigate the effects of a triazole derivative on perfusion pressure and coronary resistance in isolated rat hearts using the Langendorff technique. In addition, to evaluate the molecular mechanism involved in the inotropic activity induced by the triazole derivative on left ventricular pressure the following compounds were used as pharmacological tools; prazosin (α1 adrenoreceptor antagonist) , metoprolol (selective β1 receptor blocker) , nifedipine [antagonist of calcium-channel) , indomethacin (a nonselective inhibitor of cyclooxygenase) , BM-531 (thromboxane receptor antagonist and thromboxane synthase inhibitor) . The compounds used in this study were purchased from Sigma-Aldrich Co., Ltd. The melting point for the triazole derivative was determined on an Electrothermal (900 model). Infrared spectra (IR) were recorded using KBr pellets on a Perkin Elmer Lambda 40 spectrometer. 1H and 13C NMR (nuclear magnetic resonance) spectra were recorded on a Varian VXR-300/5 FT NMR spectrometer at 300 and 75.4 MHz (megahertz) in CDCl3 (deuterated chloform) using TMS (tetramethylsilane) as internal standard. EIMS (electron impact mass spectroscopy) spectra were obtained with a Finnigan Trace Gas Chromatography Polaris Q Spectrometer. Elementary analysis data were acquired from a Perkin Elmer Ser. II CHNS/0 2400 elemental analyzer. A solution of p-nitrobenzoyl azide (100 mg, 0.52 mmol), 1-hexyne (83 μl, 0.73 mmol) and cupric chloride anhydrous (100 mg, 0.74 mmol) in 10 mL of methanol was stirred for 48 h at room temperature. The reaction mixture was evaporated to dryness under reduced pressure and the residue washed 3 times with water. The precipitate was separated and dried at room temperature. All experimental procedures and protocols used in this investigation were reviewed and approved by the Animal care and use Committee of University Autonomous of Campeche (No. PI-420/12) and were in accordance with the guide for the care and use of laboratory animals . Male Wistar rats (n =70); weighing 200-250 g were obtained from University Autonomous of Campeche. All drugs were dissolved in methanol and different dilutions were obtained using Krebs-Henseleit solution (≤ 0.01%, v/v). Each male rat (200 - 250 g) was anesthetized by injecting with pentobarbital at a dose of 50 mg/Kg body weight. The chest was opened, and a loose ligature passed through the ascending aorta. The heart was then rapidly removed and immersed in ice cold physiologic saline solution. The heart was trimmed of non-cardiac tissue and retrograde perfused via a circulating perfusion system at a constant flow rate. The perfusion medium was the Krebs- Henseleit solution (pH = 7.4, 37°C) composed of (in mmol); 117.8, NaCl; 6, KCl; 1.75, CaCl2; 1.2, NaH2PO4; 1.2, MgSO4; 24.2, NaHCO3; 5, glucose; and 5, sodium pyruvate. The solution was actively bubbled with a mixture of O2/CO2 (95:5/5 %). The coronary flow was adjusted with a variable speed peristaltic pump. An initial perfusion rate of 15 ml/min for 5 min was followed by a 15 min equilibration period at a perfusion rate of 10 ml/min. All experimental measurements were done after this equilibration period. Evaluation of measurements of perfusion pressure changes induced by drugs administration in this study were assessed using a pressure transducer connected to the chamber where the hearts were mounted and the results entered into a computerized data capture system (Biopac). Contractile function was assessed by measuring left ventricular developed pressure (LV/dP), using a saline-filled latex balloon (0.01 mm, diameter) inserted into the left ventricle via the left atrium. The latex balloon was bound to cannula which was linked to pressure transducer that was connected with the MP100 data acquisition system. Effect induced by the triazole derivative and the compound p-nitrobenzoyl azide on perfusion pressure: Changes in perfusion pressure as a consequence of increase in time (3 to 18 min) in the absence (control) and presence of the triazole derivative or p-nitrobenzoyl azide at a concentration of 0.001 nM were determined. The effects were obtained in isolated hearts perfused at a constant- flow rate of 10 ml/min. Evaluation of effects exerted by the triazole derivative and the compound p-nitrobenzoyl azide on coronary resistance: Coronary resistance in the absence (control) and presence of the triazole derivative or p-nitrobenzoyl azide at a concentration of 0.001 nM was evaluated. The effects were obtained in isolated hearts perfused at a constant flow rate of 10 ml/min. Since a constant flow was used, changes in coronary pressure reflected the changes in coronary resistance. Effects induced by the triazole derivative on left ventricular pressure through adrenergic receptors. Intracoronary boluses (50 μl) of the triazole derivative (0.001 to 100 nM) were administered and the corresponding effect on the left ventricular pressure was determined. The dose-response curve (control) was repeated in the presence of prazosin or metoprolol at a concentration of 1 nM (duration of preincubation with prazosin or metoprolol was for 10 min equilibration period). Effects of the triazole derivative on left ventricular pressure through the calcium channel activation: Intracoronary boluses (50 μl) of the triazole derivative [0.001 to 100 nM] were administered and the corresponding effect on the left ventricular pressure was evaluated. The doseresponse curve (control) was repeated in the presence of nifedipine at a concentration of 1 nM (duration of the preincubation with nifedipine was 10 min). Effect exerted by the triazole derivative on left ventricular pressure through synthesis of prostanglandins. The boluses (50 μl) of the triazole derivative [0.001 to 100 nM] were administered and the corresponding effect on the left ventricular pressure was evaluated. The bolus was injected at the point of cannulation. The dose response curve (control) was repeated in the presence of indomethacin at a concentration of 1 nM (duration of the preincubation with indomethacin was for 10 min). Effects induced by triazole derivative on left ventricular pressure through thromboxane receptor or thromboxane synthase inhibitor activation. Intracoronary boluses (50 μl) of the triazole derivative (0.001 to 100 nM) were administered and the corresponding effect on the left ventricular pressure was determined. The dose-response curve (control) was repeated in the presence of the compound BM-531 at a concentration of 1 nM (duration of preincubation with BM-531was for 10 min). The obtained values are expressed as average ± SE, using each heart (n = 10) as its own control. The data obtained were put under Analysis of Variance (ANOVA) with the Bonferroni correction factor  using the SPSS 12.0 program. The differences were considered significant when p was equal or smaller than 0.05. The reaction product (triazole derivative, Figure 1) showed a yield of 64% with melting point of 278-280 °C. In addition, the spectroscopic analyses show signals for IR (Vmax, cm-1) at 1720, 1560 and 1324. In addition, the chemical shifts of the spectroscopic analyses of 1H NMR and 13C NMR for the triazole derivative is showed in the table 1 and 2. Finally, the result of mass spectroscopy (70 electrovolts) was m/z 342.02. Additionally, the elementary analysis data for the triazole derivative (C13H16N4O3) were calculated (C, 56.51; H, 5.84; N, 20.28; O, 17.37) and found (C, 56.50; H, 5.82). Table 2: 13C NMR (300 MHz, CDCl3) data for the triazole derivative. The activity induced by the triazole derivative and the compound p-aminobenzoyl azide on perfusion pressure and coronary resistance in the isolated rat hearts was evaluated. The results obtained from changes in perfusion pressure as a consequence of increase in the time (3 to 18 min) in the absence (control) or in presence of the triazole derivative (Figure 2), showed that triazole derivative [0.001 nM] significantly increases the perfusion pressure (p = 0.05) in comparison with the control conditions and p-aminobenzoyl [0.001 nM]. Other results (Figure 3) showed that coronary resistance, calculated as the ratio of perfusion pressure at coronary flow assayed (10 mL/min) was significantly higher (p = 0.06) in presence of the triazole derivative at a concentration of 0.001 nM in comparison with the control conditions and p-aminobenzoyl [0.001 nM]. 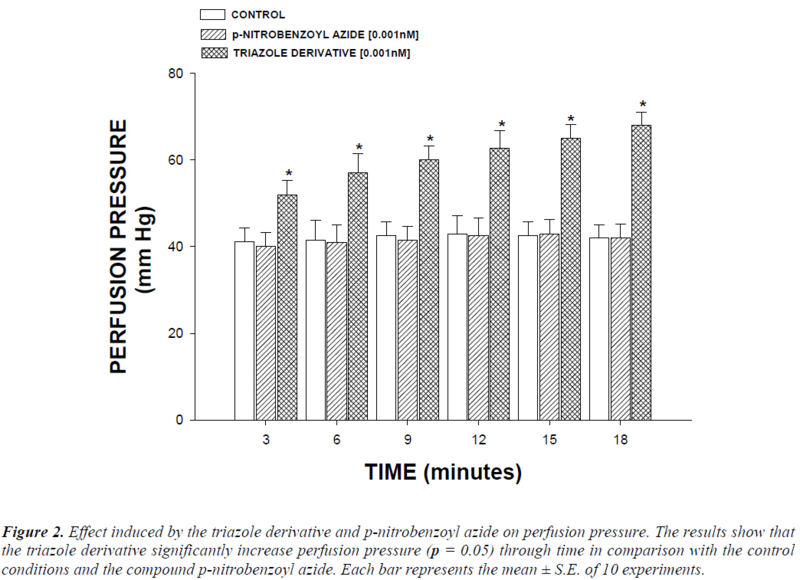 Figure 2: Effect induced by the triazole derivative and p-nitrobenzoyl azide on perfusion pressure. The results show that the triazole derivative significantly increase perfusion pressure (p = 0.05) through time in comparison with the control conditions and the compound p-nitrobenzoyl azide. Each bar represents the mean ± S.E. of 10 experiments. Figure 3: Activity exerted by the triazole derivative and p-nitrobenzoyl azide on coronary resistance. The results show that coronary resistance was higher (p = 0.06) in the presence of the triazole derivative in comparison with the control conditions and the compound p-nitrobenzoyl azide. Each bar represents the mean ± S.E. of 10 experiments. 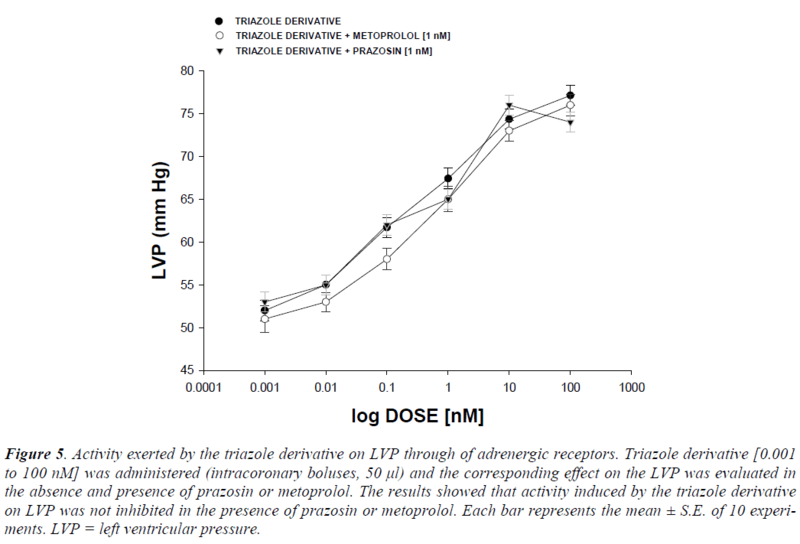 Other experimental data showed that activity exerted by the triazole derivative in a dose range of 0.001 to 100 nM increased the left ventricular pressure (Figure 4) and this effect was not inhibited in presence of prazosin, metoprolol or nifedipine drugs (Figure 5 and 6) at a concentration of 1 nM. Finally, other data obtained (Figure 7) indicate that the triazole derivative induces an increase in left ventricular pressure in a dose dependent manner [0.001 to 100 nM] and this effect was significantly inhibited by indomethacin (p = 0.05) and BM-531 (p = 0.05) at a dose of 1 nM. Figure 4: Effects induced by the triazole derivative on left ventricular pressure. In the graph is showing the biological activity exerted by the triazole derivative in dose of 0.001 to 100 nM on the left ventricular pressure (LVP). Figure 5: Activity exerted by the triazole derivative on LVP through of adrenergic receptors. 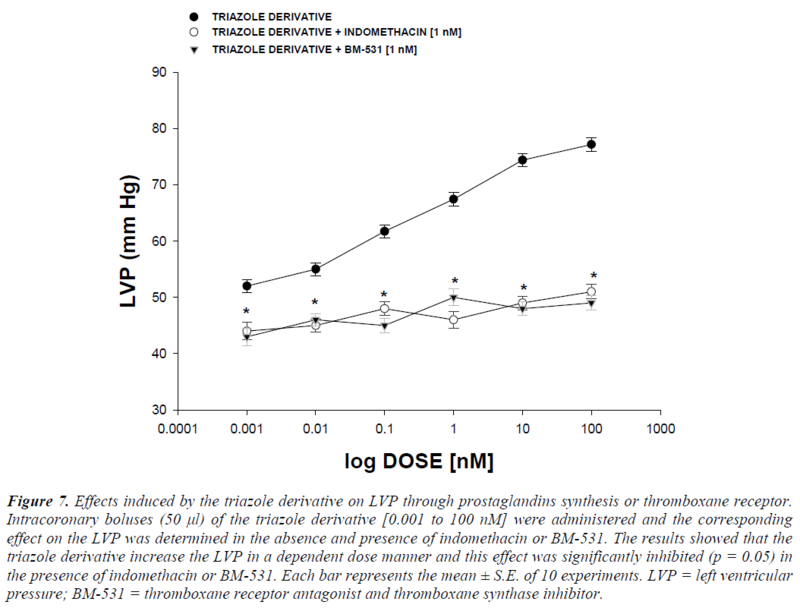 Triazole derivative [0.001 to 100 nM] was administered (intracoronary boluses, 50 μl) and the corresponding effect on the LVP was evaluated in the absence and presence of prazosin or metoprolol. The results showed that activity induced by the triazole derivative on LVP was not inhibited in the presence of prazosin or metoprolol. Each bar represents the mean ± S.E. of 10 experiments. LVP = left ventricular pressure. 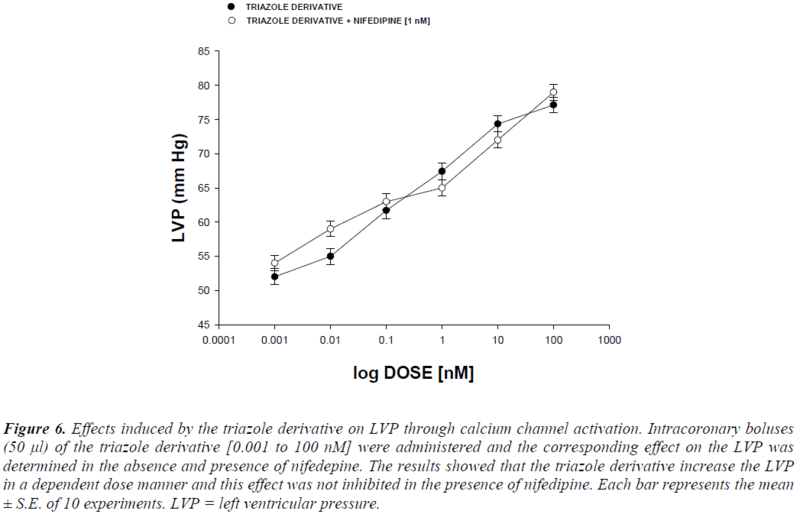 Figure 6: Effects induced by the triazole derivative on LVP through calcium channel activation. Intracoronary boluses (50 μl) of the triazole derivative [0.001 to 100 nM] were administered and the corresponding effect on the LVP was determined in the absence and presence of nifedepine. The results showed that the triazole derivative increase the LVP in a dependent dose manner and this effect was not inhibited in the presence of nifedipine. Each bar represents the mean ± S.E. of 10 experiments. LVP = left ventricular pressure. Figure 7: Effects induced by the triazole derivative on LVP through prostaglandins synthesis or thromboxane receptor. Intracoronary boluses (50 μl) of the triazole derivative [0.001 to 100 nM] were administered and the corresponding effect on the LVP was determined in the absence and presence of indomethacin or BM-531. The results showed that the triazole derivative increase the LVP in a dependent dose manner and this effect was significantly inhibited (p = 0.05) in the presence of indomethacin or BM-531. Each bar represents the mean ± S.E. of 10 experiments. LVP = left ventricular pressure; BM-531 = thromboxane receptor antagonist and thromboxane synthase inhibitor. In this study we report a straightforward route for the preparation of a triazole derivative. It is important to mention that there are several procedures for the synthesis of triazole derivatives described in the literature; nevertheless, despite its wide scope, the former protocols suffer from several drawbacks because some reagents have limited stability [15-18]. In our experiment, the synthesis of the triazole derivative was developed by the reaction of pnitrobenzoyl azide with 1-hexyne using chloride anhydrous as catalyst. The structure of the triazole derivative was confirmed using IR and NMR spectroscopy (Table 1 and 2). The IR spectra contained characteristic vibrations at 1720 for ketone group; at 1560 for ring triazole and 1324 for nitro group. The 1H NMR spectrum of the triazole derivative shows signals at 0.90 ppm for methryl group; at 1.38-2.46 ppm for methylene groups involved in the arm that was bound to triaziole ring; at 5.80 ppm for proton involved in triaziole ring; at 8.03-8.20 ppm for phenyl groups; at 9.10 ppm for amino groups. The 13C NMR spectra displays chemical shifts at 14.30 ppm for methyl group; at 24.10-27.07 ppm for carbons involved in the arm which was bound to triazole ring; at 122.76-18.80 and 147.70 ppm for phenyl group; at 113.42 and 140.76 ppm for triazole ring; at 167.10 for ketone group. Finally, the presence of triazole derivative was further confirmed from mass spectrum; which showed a molecular ion at m/z 276.10. There are data, which indicate that several triazole derivatives exert effects on the cardiovascular system [7,19] (Sato et al., 1980; Novinson et al., 1982); however, the cellular site and molecular mechanism involved in its inotropic activity are very confusing. In our this study, the effect exerted by a new triazole derivative on blood vessel capacity and coronary resistance; translated as changes in perfusion pressure was evaluated, in isolated rat heart model. The results obtained show that the triazole derivative significantly increases the perfusion pressure over time compared to the control conditions. These data suggest that the triazole derivative exerts effects on perfusion pressure; which could subsequently modify vascular tone and coronary resistance of heart. In order to assess this hypothesis, the activity exerted by the triazole derivative on coronary resistance was evaluated. The results indicate that coronary resistance was increased in the presence of the triazole derivative. Analyzing these data and chemical structure of the triazole derivative, alternative experiment were carried out using the compound p-benzoyl azide to evaluate whether this compound exerts any changes on perfusion pressure and coronary resistance, since there are reports which indicate that some compounds with nitro groups can induce changes in blood pressure . The results indicated that p-benzoyl azide does not exert changes on perfusion pressure and coronary resistance in comparison with the triazole derivate. These data suggest that only the triazole ring in the triazole derivative may be responsible for its pharmacological activity, which could result in the release or activation of vasoactive substances such as catecholamines; which may induce a positive inotropic effect. There are reports suggesting that some triazole derivatives can stimulates catecholamine production ; therefore, in this study the effect exerted by the triazole derivative on left ventricular pressure was evaluated in the absence or presence of prazosin and metoprolol. The results showed that, the effect induced by the triazole derivative was not inhibited in presence of these compounds. These data indicate that the mechanism involved in the effects of this triazole-derivative on left ventricular pressure was not through adrenergic activity. Some investigations have reported that several derivatives induce their effects on blood pressure via the calcium channels activation . In this study, the activity induced by the triazole derivative on left ventricular pressure was evaluated in the absence and presence of nifedipine. The results showed that the effect exerted by the triazole derivative was not inhibited in the presence of nifedipine, which indicate that the triazole derivative does not act via activation calcium channel. On the other hand, while analyzing experimental data obtained, we also considered validating the effect induced by some compounds on left ventricular pressure via prostaglandins synthesis  and to evaluate the possibility that the activities exerted by the triazole derivative involve stimulation and secretion of prostaglandins. To see this, the effect of triazole derivative on left ventricular pressure in the absence and presence of indomethacin was studied. The results showed that effect induced by the triazole derivative on left ventricular pressure was blocked by indomethacin. These data indicate that activity exerted by the triazole derivate on left ventricular pressure involve prostanoids synthesis and secretion. There might be a possibility that the triazole derivative may induce its activity on left ventricular pressure via syntheses of thromboxane A2 (TXA2). To study this, the effect of the triazole derivative on left ventricular pressure in absence and presence of BM-531 was evaluated. The experimental data showed that the effect of the triazole derivative on left ventricular pressure in presence of BM-531 was inhibited significantly. However, it is important to mention that the activity induced by the triazole derivative in different doses in the presence of BM-531 was not totally blocked. These data suggest that positive inotropic activity induced by the triazole derivative is via activation of TXA2. Triazole derivative is a particularly interesting drug because the positive inotropic activity induced by this compound involves the activation or release of thromboxane A2. This phenomenon may result in a decrease in adverse effects such as cardiac arrhythmia and ischaemia induced by several cardiotonic agents such as cardiac glycosides and sympathomimetic amines [24,25]. Clark A. The mode of action of strophantidin upon cardiac tissue.J Pharm ExpTiss.1914; 5:215-234. Pignier C, Keller M, Vié B, Vacher B, Santelli M. A novel steroid-like compound F90927 exerting positiveinotropic effects in cardiac muscle. Br J Pharmacol. 2006; 147:772-782. Ting L,Ling Z, Zhe Q,Hai Z, Hu P. Synthesis and positive inotropic evaluation of 1-(benzylamino)-3-(4,5-dihydro[1,2,4]trizaolo[4,3-a]quinolin-7-yloxy)-propan-2-ol derivatitives.Chinese ChemLett.2009; 20:175-177. Ji-Yong L,Hai-Ling Y, Zhe-Shan Q,Xun C,Hu-Ri P. Synthesis and inotropic evaluation of 1-substituted-N-(4,5-dihydro-1-methyl-[1,2,4]triazolo[4,3-a]quinolin-7-yl)piperidine-4-carboxamides. Bioorg Med Chem Lett 2009; 19: 2392-2395. Chun-Bo Z, Xun C, Lan H, Zhe-Shan Q,Hu-Ri P. Synthesis and positive inotropic activity of N-(4,5-dihydro-[1,2,4]triazolo[4,3-a]quinolin-7-yl)-2-(piperazin-1-yl)acetamide deriva-tives. Bioorg Med ChemLett. 2008;18:4606-4609. Jing-Yuan L, Xun C, Xue-Kun L, Lan H, Zhe-Shan Q. Synthesis and Positive Inotropic Evaluation of 2-(4-(4-Substituted benzyloxy)-3-methoxybenzyl)-1,4-diazepan-1-yl)-N-(4,5-dihydro-1-methyl[1,2,4] triazolo [4,3-a]quinolin-7-yl)-acetamides. Archiv Der Pharm. 2008; 341:794-799. Sato Y, Yasuo S, Hiroshi F, Hiroshi N, Hiroshi M,Shinsaku K. Studies on Cardiovascular Agents. Synthesis and Coronary Vasodilating and Antihypertensive Activities of 1,2,4-Triazolo[ l,5-a]pyrimidines Fused to Heterocyclic Systems. J Med Chem. 1980; 23:927-937. Graham R, Oates H, Stoker L, Stokes G. Alpha blocking action of the antihypertensive agent, prazosin. J PharmacolExperTher.1977; 201:747-752. Bengtsson C, Johnsson G, Regårdh C. Plasma levels and effects of metoprolol on blood pressure and heart rate in hypertensive patients after an acute dose and between two doses during long-term treatment. Clin-PharmacolTher. 1975; 17: 400-408. Henry P. Comparative pharmacology of calcium antagonists: nifedipine, verapamil and diltiazem. Am J Cardiol.1980; 46:1047-1058. Owen T, Ehrhart I, Weidner W, Scott J, Haddy F. Effects of indomethacin on local blood flow regulation in canine heart and kidney. Exp Biol Med. 1975; 149: 871-876. Dogné J, Rolin S, De-Leval X, Benoit P, Neven P . Pharmacology of the Thromboxane Receptor Antagonist and Thromboxane Synthase Inhibitor BM-531. Cardiovas Drug Rev. 2001; 19:87-96. Bayne K. Revised Guide for the Care and Use of Laboratory Animals available. Am Physiol Soc Physiologist. 1996; 39: 208-211. Hocht C Opezzo L, Gorzalczany S. Una Aproximación Cinética y Dinámica de Metildopa en Ratas con Coartación Aórtica Mediante Microdiálisis. Rev Argent Cardiol. 1999; 67:769-773. Czarnocka-Janowicz A, Foks H,Nasal A, Petrusewicz J, Damasiewicz R . Synthesis and pharmacological activity of 5-substituted-s-triazole-3-thiols.Die Pharmazie. 1991; 46:109-112. Srinivas C, Fang X, Qian W. One-pot synthesis of triazole-linked glycoconjugates. Tetrahedron Lett. 2005; 46: 2331-2336. Pagliai F,Tracey P,Del-Grosso E,Di-Brisco R,Tron G. Rapid Synthesis of Triazole-Modified Resveratrol Analogues via Click Chemistry. J Med Chem. 2006; 49: 467-470. Barral K,MoorhouseA, Moses J. Efficient Conversion of Aromatic Amines into Azides: A One-Pot Synthesis of Triazole Linkages. Org Lett .2007; 9: 1809-1811. Novinson T, Springer R, O'Brien D, Scholten M, Miller J. 2-(Alkylthio)-1,2,4-triazolo[1,5-a]pyrimidines as Adenosine Cyclic 3',5'-Monophosphate Phosphodiesterase Inhibitors with Potential as New Cardiovascular Agents. J Med Chem. 1982; 25:420-426. Del-Tacca M, Bertelli A, Mazzanti L, Stacchini B. Conformational Effects on the Activity of Drugs. 5.' Pharmacological Properties of 2-(p-Nitrophenyl)-4-isopropylmorpholine, a Cyclic Analog of INPEA.J Med Chem. 1975; 18: 836-838. Walker D, Mailman R. Triadimefon and Triadimenol: Effects on Monoamine Uptake and Release. ToxicolApplPharmacol. 1996; 139: 227-233. Figueroa-Valverde L Díaz-Cedillo F, López-Ramos M, García-Cervera E, Pool-Gómez E. Design and synthesis of an estradiol derivative and evaluation of its inotropic activity in isolated rat heart. African J Pharm Pharmacol.2011; 5: 1703-1712. Pierard L, Berthe C, Albert A. Haemodynamic Alterations during Ischaemia Induced by Dobutamine Stress Testing. Eur Heart J. 1989; 10: 783-790. Feldman A. Classification of Positive Inotropic Agents. J Am Coll Cardiol 1993; 22: 1223-1227.